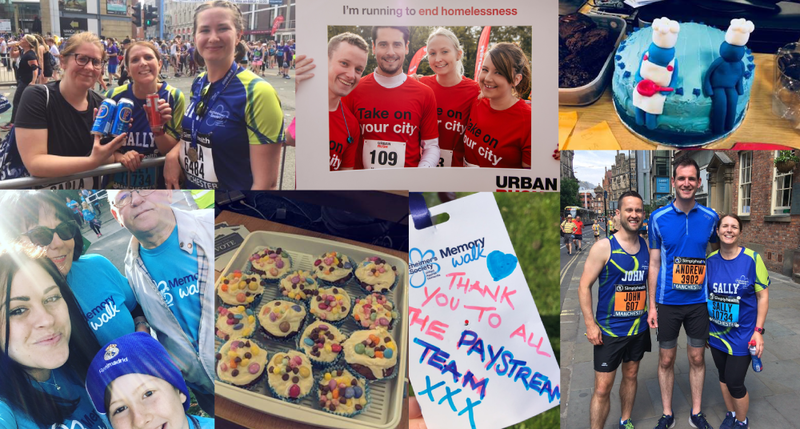 At PayStream we have had another hugely successful year raising a grand total of £4400 for lots of different charities, something we’re all extremely proud of. Over the last year we have taken part in a step-a-thon to raise money for Sports Relief, bake sales, raffles, sweepstakes, pumpkin carving and lots of dressing up! In addition to all the events held in our offices we have also been busy outside of work raising money whilst getting active. A group of PayStream staff took part in the Great Manchester Run in May which raised an incredible £1,138 for the Alzheimer’s Society. In 2018 we also raised over £2600 for one of our employees, Keith Atkinson whose wife, Laura has been diagnosed with a rare form of cancer and is in need of private treatment. In July another team of PayStream employees took part in the Race for Life, this time raising over £700 for Cancer Research UK. Several PayStream employees took part in the Memory Walk back in October again for the Alzheimer’s Society. Well done especially to Kane Oldfield and Laura Hughes who managed to raise over £1200 between them! Whilst Martin Brennan and Vicky Knight’s participation in Urban Rush raised nearly £1000 for the homeless charity Shelter. And finally, in the run up to Christmas, many PayStream employees donated presents for the Cash for Kids, Mission Christmas appeal. As you can see we’ve had a busy year raising money for lots of different charities so a massive thank you to everyone who has participated and donated. We’re already planning what we can do in 2019 to continue to help where we can by raising as much money as possible for even more great causes!